Why these easy healthy recipes? Well, in today's busy life when you are always rushed off your feet to complete the daily chores, when you reach back home totally exhausted and all you can think of is 'I am not in a mood to cook' but you still don't want to throw a ready meal in the microwave, then these easy recipes will definitely come handy. You can make some preparations in advance and then just finish with the last minute requirements. Please remember these recipes are just to enhance your imagination. Use whatever ingredients available in your refrigerator and pantry for such quick cooking. Although I have put together a few concoctions on this page but please do explore the whole site for more free easy healthy recipes. Why limit the use of oats for just the breakfast with honey or sugar or in the the making of desserts like oat cookies etc. I say use them for a quick lunch or dinner. When time is of essence and you don't want to compromise your families health, this recipe might be the solution. This is a one pot meal or a quick oats khichdi if you like. A very easy healthy recipe. A pressure cooker comes very handy while making this as that cuts down on the cooking time of vegetables. Mix the quick oats later, as they will need 2-3 minutes to cook. Chop all the vegetables into equal shape and size. Heat a pressure cooker and add oil in it. Now add the cumin seeds and as soon as they crackle and the onions. Cook till light brown in color, then add the ginger garlic paste. Saute on a low heat for 2 minutes. Now add tomatoes and chilies and cook till they become mushy. At this stage add all the vegetables, except coriander. Add salt and pepper to taste. Finally, add 2 cups of water and pressure cook until the first whistle. Open the pressure cooker lid after the pressure settles down. Put it back on the stove, add the oats and more hot water if need be. Cook for 2-3 minutes until the oats are done. Add more salt if required. Make it a little soggy by adding hot water. Garnish with fresh coriander. Enjoy this meal with plain yogurt. Mung bean or whole moong dal is considered as the most healthy dal among all dals (legumes / lentils). Unlike most beans, mung beans contain very few oligo saccharides, the sugars responsible for flatulence. Hence they are good for anyone suffering from digestive problems. When you eat them sprouted that introduces the vitamin C content which does not exist in the whole moong bean itself. Bean sprouts can be bought easily and even grown at home. I usually do mine at home. Although at home the sprouts will never come as big as the commercial ones, still they are healthy. If buying raw sprouts always make it a point to wash them, to get rid of any harmful bacteria that can are associated with warm environments. Chilling and cooking the sprouts also prevents any food borne illness. Mung Bean Sprouts contain contain pure forms of vitamins A, B, C, and E, in addition to important minerals including Calcium, Iron, and Potassium. Vitamin C is only available when the moong bean is sprouted. Mung beans sprouts have no cholesterol and low in calories. One cup of mung bean sprouts contains only approximately 30 calories, 3 grams of protein, only 6 carbohydrates and only .2 grams of fat. They also contain a high source of fiber, are easily digestible and contain a high concentration of enzymes facilitating the digestive process. Now let us get on with the salad recipe. Heat oil in a wok and add the chopped ginger-garlic. Stir fry for 30 seconds then add the onion and spring onion bulbs as well. Stir fry for a minute and add the chili and sprouts. On a high flame stir fry for just a minute. Add the rest of the ingredients (except spring onion greens) and toss well. Turn off the heat and garnish with spring onions. 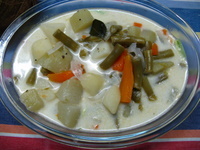 Whenever I am in a hurry and want to cook a easy healthy recipe, a vegetable stew comes for my rescue. You can use any vegetables of your choice to make this stew, I use the ones that are easily available in the refrigerator most of the times. I pressure cook the vegetables as that not only preserves the nutrients but also fastens the cooking time. So, if you first put the vegetables in the pressure cooker, then the rice in the pressure cooker or rice cooker and lastly do the tempering, your meal will be ready in 20 minutes. This sure is a easy healthy recipe not to mention yummy. Pressure cook all the vegetables by using very little water. Turn off the heat as soon as the first whistle blows. Alternately steam all the vegetables in a electric steamer, in the microwave or on the stove, until just tender. Coarsely crush the cardamom and mace flower in a pestle and mortar. Heat the oil in a pan and add the mustard seeds. Wait for them to sputter, then add the crushed cardamom and mace. Saute on a low heat for 30 seconds and add the sliced onions, curry leaves and green chilies. Cook till onions are just soft. not caramelized. Now add the cooked vegetables along with the water. If using steamed vegetables, add a little hot water at this stage. Give a quick boil and reduce the heat, add the salt and gradually pour the coconut milk, stirring continuously. Simmer for 5 more minutes and turn off the heat. Keep covered for 5-10 minutes so that the flavors can seep in. 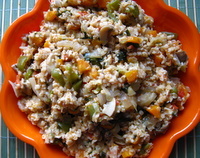 Serve with boiled or steamed rice or string hoppers (idiappam or even appams).